How Vladimir Putin gave ice cream to Xi Jinping, why he refused Shinzō Abe’s invitation to the onsen, and why he misses Mahatma Gandhi. Russia and Eastern countries have a long history of cultural and political relations. During the presidency of Vladimir Putin, the Russian president has paid special attention to political ties with the East, meeting Asian leaders on so many occasions that the media chit-chat has frequently strayed beyond the realm of politics. 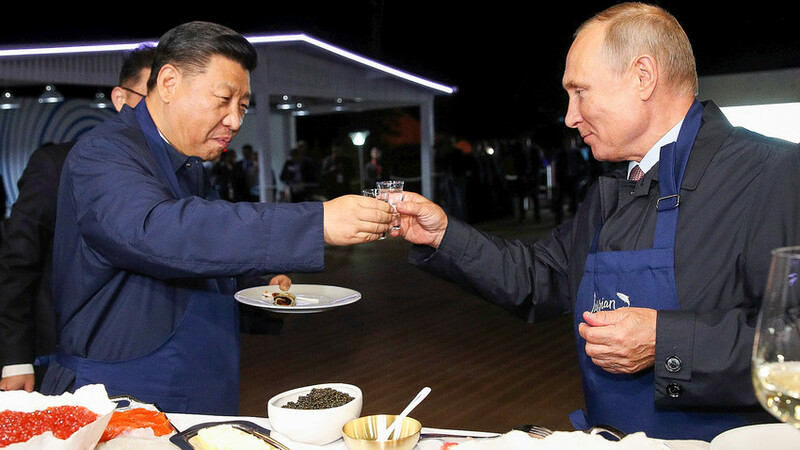 In 2016, during the G20 summit in Hangzhou, Vladimir Putin bestowed a very unusual diplomatic gift on the president of the People's Republic of China Xi Jinping. Instead of paintings or expensive dishes, Putin presented a box of Russian ice cream brought specially from Vladivostok in a refrigerator. 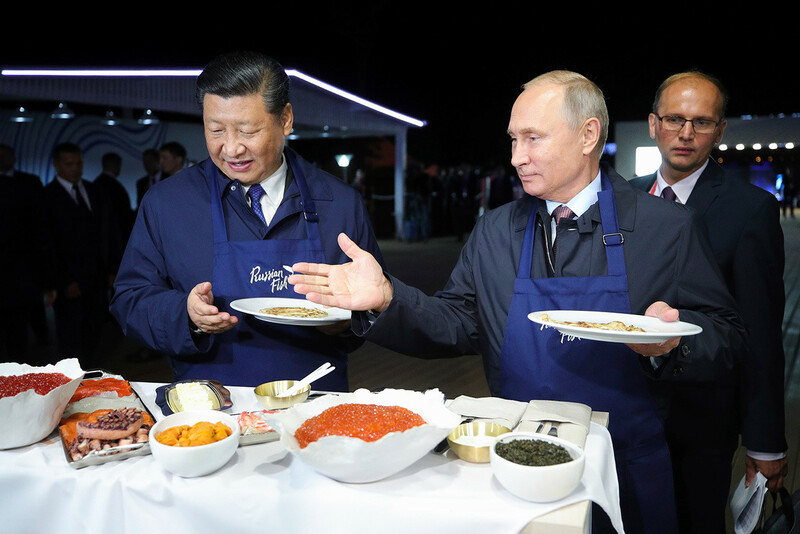 Putin said that Chinese businessmen had complained to him about the low availability of Russian ice cream in China: Russian ice cream is imported into China from the Russian Far East, but because of the customs regulations, it rarely arrives fresh. So the Russian president decided to bring some with him. Visibly pleased, Xi Jinping confessed to buying Russian ice cream every time he visits Russia, and his family loves it very much. 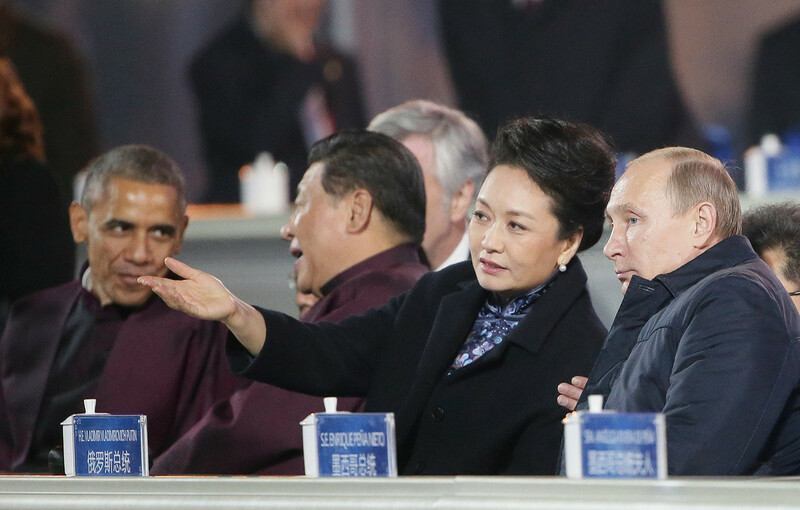 At the APEC 2014 summit, Vladimir Putin was seated next to Xi Jinping’s spouse, Peng Liyuan. While her aforementioned husband was distracted in conversation with Barack Obama, the ever alert Russian leader stole the opportunity to wrap a woolen shawl around Peng Liyuan’s shoulders. She smiled and thanked the attentive Russian president. Moments later, though, she handed the warm shawl to her bodyguards in exchange for a warm jacket. Chinese TV showed the episode live, but edited it out of all the future news broadcasts. Chinese people are very sensitive when it comes to personal space. In Chinese culture, it is not permitted to touch another man’s spouse. Even in terms of common diplomatic etiquette, what Putin did was somewhat risky. The episode caused a stir on Chinese social media. Most Chinese users expressed their liking and support for Putin nonetheless, but there were some who criticized him for supposedly breaking etiquette. However, it was not new territory for Putin, having performed the same gesture of chivalry with the shoulders of German Chancellor Angela Merkel a year earlier in 2013. 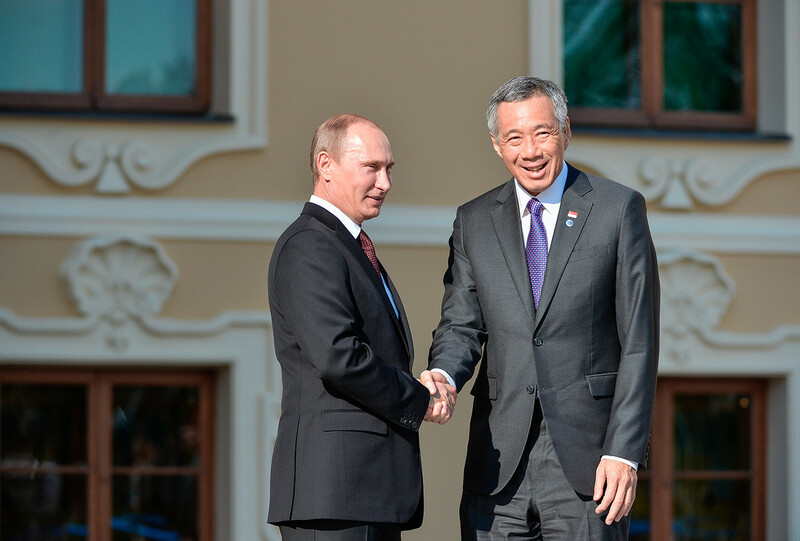 In November 2018, Vladimir Putin was delayed on his way to a meeting with Lee Hsien Loong, Singapore’s prime minister. The tight schedule of both leaders, security delays at the airport, and traffic conditions pushed the head-to-head to the next day’s agenda. It was a very rare occurrence when a diplomatic meeting between two leaders was rescheduled because one of them was 1.5 hours late. At the same Singapore meeting, Indian Prime Minister Narendra Modi displayed excessive affection for Vladimir Putin by not only shaking his hand but clasping him in a warm, almost Russian-esque embrace. 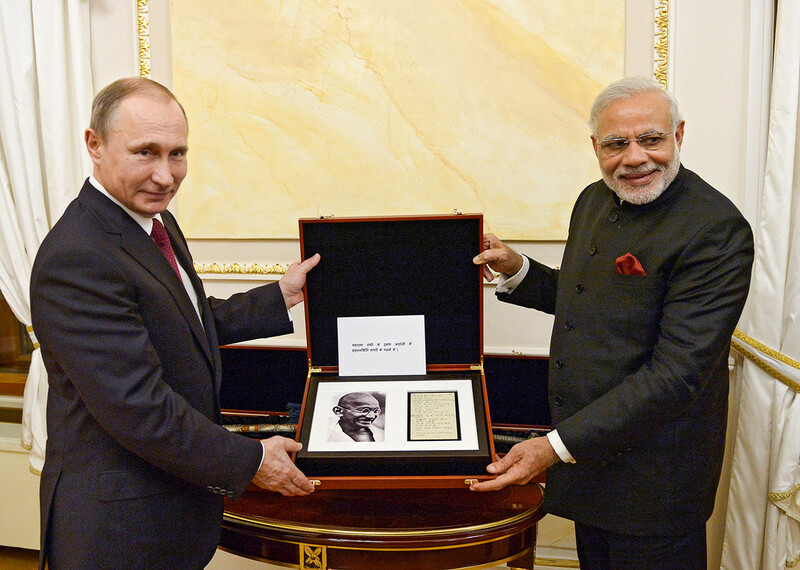 Earlier, in 2015, at an informal meeting in Moscow, Narendra Modi had presented Vladimir Putin with two meaningful gifts: an 18-century Indian sword and an original fragment of Mahatma Gandhi's handwriting. 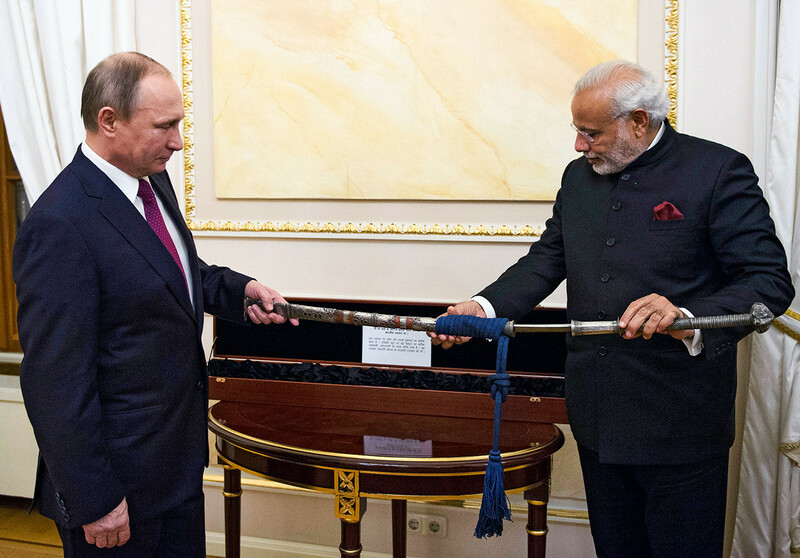 While the sword was meant to underline the strategic military partnership of the two countries, Gandhi's handwriting brought to mind an earlier famous quote by Vladimir Putin. In 2007, replying to a question from a journalist for German magazine Der Spiegel on the balancing act between democracy and totalitarianism in the Russian state, Vladimir Putin responded that he was the only pure and true democrat in the entire world, adding that “after Mahatma Gandhi, there’s no one to talk to.” Putin went on to explain that there were indeed problems with democratic institutions in Russia, but it had to be taken into account that Russia had suffered a lot during the transition from the Soviet Union to the present state – the civil war in the Northern Caucasus, to name just one. Japanese Prime Minister Shinzō Abe is arguably the foreign leader Vladimir Putin sees the most: 25 official meetings so far, and counting. 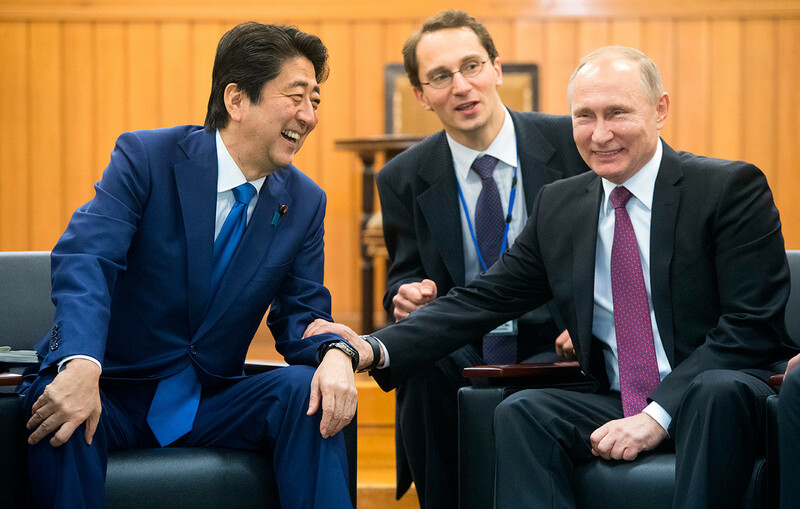 The two leaders always have plenty to discuss, especially the question of the Kuril Islands. During Putin’s visit to Japan in 2016, Shinzō Abe suggested a joint visit to an onsen (thermal spring) in Nagano city, Abe’s hometown. The Russian president, however, politely declined the offer. Instead, he and Abe visited the Kodokan Centre of Martial Arts in Tokyo, where they enjoyed a judo demonstration. Judo is one of Putin’s favorite sports. 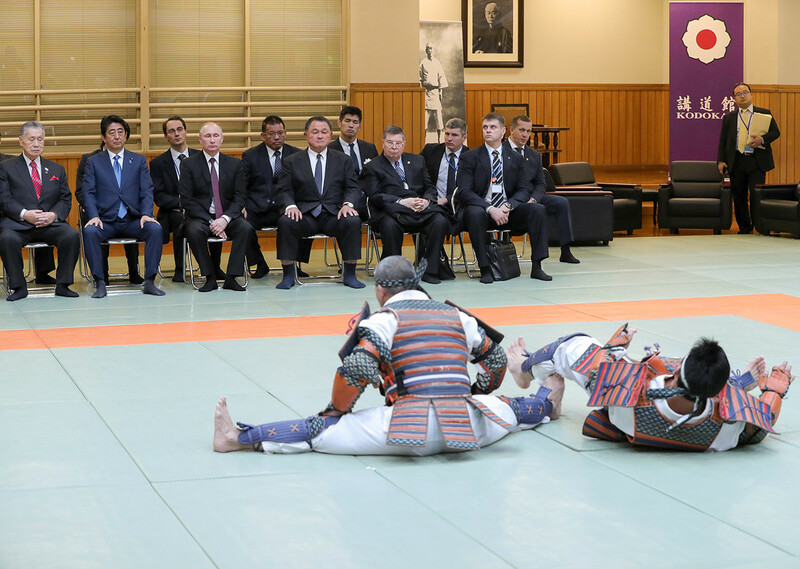 “I got into judo when I was just a kid, and Eastern martial arts in general – their special philosophy, the ethics of communication with your opponent, and the rules of engagement,” Putin says.